In my somewhat futile attempt to keep GEMPAK barely breathing and useful, I occasionally make new custom color tables, largely based on existing NCL color tables. 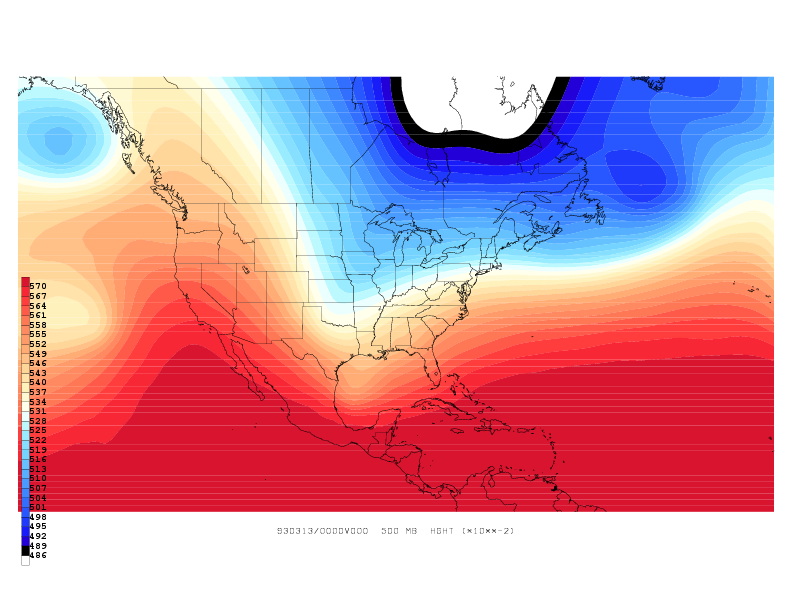 Below are sample 500-hPa geopotential height plots and descriptions of current available custom tables. Click on the description to download a .txt file with the color table. In order to fully use the color tables for all output devices, you will have to cp each .txt file into three identical GEMPAK color table files, coltbl.psc, coltbl.tbl, coltbl.xwp, and make sure to have them in the directory from which you run GEMPAK. Alternatively, you could replace the default GEMPAK color table files of the same time in the GEMPAK tables directory (at your own risk). In all color tables, Color 1 and 32 are set to black, and color 0 is white. Based on NCL "Red to white"